Multipurpose WordPress themes like those listed here are great for any web designer. They are more than suitable for just about anything in terms of website types or uses that you can throw at them. The old argument that a tool that's designed to do a wide range of tasks can only do some of them flawlessly is simply not true in this case. You will, however, notice that several specialty themes have been included in the mix. Closer examination will show you why this has been done. It's not that the multipurpose themes aren't up to the task. We've simply found a couple of tools that can make your design work even easier. These products are the best of their kind on the market today. So you needn't worry about making a less than ideal choice. Once you take into account BeTheme's 40 core features, first and foremost of which is the selection of 320+ professionally-designed pre-built websites, you're going to conclude that this multipurpose WordPress theme is indeed capable of handling anything you can throw at it in terms of website design requirements and web-building performance. Searching for a theme that's the best fit for an obscure business niche is often a time-consuming, frustrating task that can take hours. With BeTheme, the same task can usually be accomplished in minutes. Not only is finding a perfect match highly likely, finding one that's nearly perfect is just as good since each of these pre-built websites is easily customizable. You can install one with a single click and then let Be's Muffin Builder, Options Panel, Shortcode Generator and other design options and special effects make their contributions. Given the size of Be's user base and the fact it's a top 5 ThemeForest best-seller would suggest that you give this premium multipurpose theme some serious thought. Total is a top selling WordPress theme for a reason. With 500+ Customizer styling options, up to 100+ drag&drop page builder elements, and compatibility with popular free & premium plugins it's easy to see why so many people choose Total. Getting started with a new website couldn't be easier. Just install Total and use the demo importer to have your website ready to launch in no time. The extended WPBakery Visual Page Builder makes it easy to create custom page layouts with pricing tables, callouts, buttons, contact forms, galleries and more. Plus the included premiums sliders mean you can further customize your pages to really stand-out on the web. While Total is a great fit for folks building their own websites, developers will love Total as well. Hundreds of custom filters and snippets in addition to built-in hooks and well -commented code means customizing client sites is super easy. Porto is a free eCommerce-oriented theme that is easy and flexible to work with, responsive, and super-fast! As it is built around a Bootstrap 4 framework, you can expect both speed and high performance. In the Porto package, you'll find demos, a nice selection of home page layouts and skins and internal and special page layout styles. You'll also find a useful selection of shop pages, 4 different portfolio layouts, and 4 different blog layouts. Visual Composer with Ultimate addons is Porto's page builder. This multipurpose theme is WooCommerce compatible as you would expect and includes shop and product archive pages, an Ajax filtering feature, wish list functionality, and a WooCommerce catalog mode – everything you want to set up an online shop. Like the theme itself, Porto's support team's mission is lightning-fast service. TheGem is a visually stimulating responsive WordPress creative multipurpose website theme. TheGem is a robust platform for the development of all sorts of beautiful modern websites in a speedy and uncomplicated manner and with plenty of freedom for visual and creative styling. The authors of the theme had in mind a veritable Swiss Army knife of website-building tools in mind when they produced TheGem. 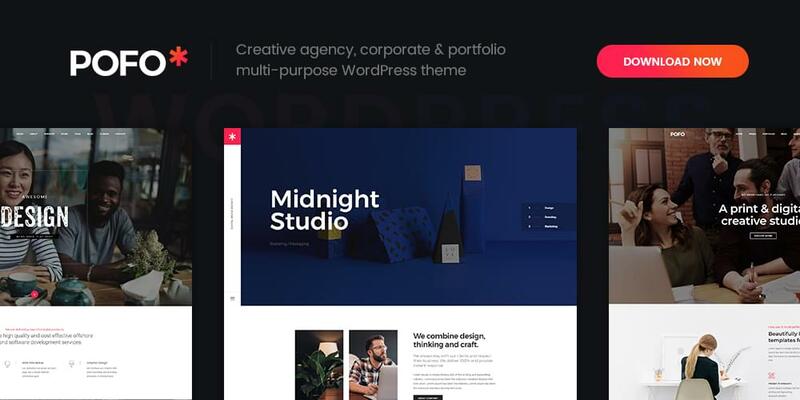 This multipurpose theme offers every tool you'll ever need to create stunning one page or multipage business or creative websites. There's a great selection of blog and portfolio layouts as well, plus 70+ design concepts and 200 demos to get you off to a solid start. Take TheGem for a spin. Houzez is a specialty theme dedicated for use in the real estate sector. The real estate niche tends to be busy in good times and bad, making it a potential goldmine for any web designer who has an interest in the area. Houzez is responsive, easy to work with, and has the features realtors and real estate agencies want and need. These include Google geolocation, advanced and radius search, and customizable listings layouts. We all want to be able to create award-winning websites, but we aren't always sure how to go about it. Uncode has the tools and features needed to produce award winners, and if you visit their website, you can see what their customers have done using this multipurpose, creative WordPress theme. Uncode's showcase, and it's a big one, is impressive as well as a source of inspiration. Visit the website, take notes, and make your purchase! You can quickly set up a site with Themify Ultra's unique collection of pre-made demo sites, skins, and other design elements. The skins can be used to transform your site's appearance, or you can set up a sample site in minutes and experiment with different skins with just a click until you get the look you want. Selections of post, header, and footer layouts, page layouts, and a free post type plugin are included. Layers is SEO friendly, responsive, WooCommerce ready, and free! There are various extensions that can be used with this multipurpose theme, extensions you must pay for, and there is also a Layers Pro version. This default free version with its point and click editor will enable you to create awesome websites. We suggest you download the free version, give it a try, and see if you need any of the extensions. 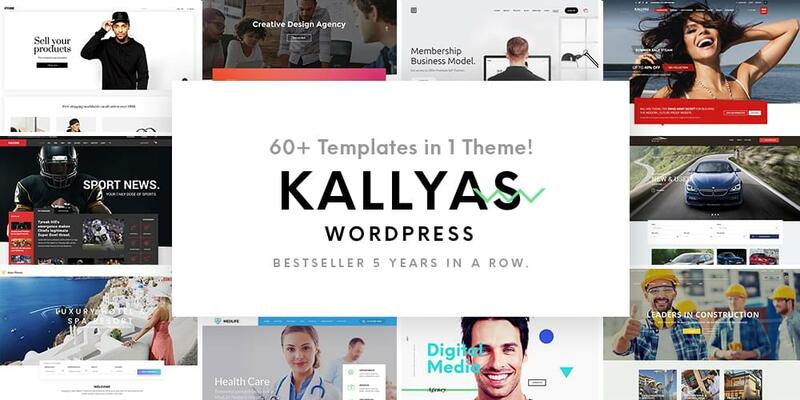 Kallyas is a super-fast, responsive, high-performance multipurpose theme that's loaded with the tools you need to address the needs of any client, regardless of the website type or business niche involved. Key features include a selection of pre-made website templates to get projects underway and the integrated visual builder. 6 months of dedicated support come with your purchase, plus you'll get free updates and have access to Kallyas' 150 video tutorials. Pofo is fast, responsive, SEO friendly and modern design WordPress theme! Its designs are pixel perfect, fully responsive, and in line with the latest web design trends. Pofo is ideal for building websites in which portfolios pay a key role since the quality of a portfolio can have a major impact on a site's conversion rate. Pofo uses the WordPress Customizer and custom shortcodes and features 150+ design elements, 25+ home pages, and 200+ demo pages. With Elementor's 50+ templates, the OrbitFox plugin, and the Hestia web design theme within easy reach, you can build anything and do so visually. The free version of Hestia provides all the design horsepower you need to get started, and it may be all you'll ever need. Hestia is based on Material Design principles. This multipurpose theme's single page format makes navigation easier for both the designer and the end users. When its authors created Stormyday, they did so with the intent of helping its users to make a statement. Included in this flexible, responsive multipurpose WordPress blog theme's package is an extensive selection of page layouts and live demos (with one-click install) together with the recently introduced and already gaining in popularity PremiumCoding page builder. A host of CSS3 features and animations, Revolution Slider, smooth scrolling, and parallax backgrounds top things off. Since Fildisi adjusts to your rules, rather than the other way around, this multipurpose theme could make your life as a web designer much easier. As is the case with the other multipurpose theme's we've selected, Fildisi is an excellent choice for bloggers, creatives, designers, or whatever business niche or website type your future projects will address. Is website sameness starting to become a problem for you? It happens to almost any web designer. Whether it's happening or not, it's a good time to give Movedo a look. This multipurpose theme offers several cool and outside-the-envelope features like moldable typography, ultra-dynamic parallax effects, unique clipping animations, and other not-so-common design elements designed to spice up any website. Maybe it's a good time for you to break the mold and rock the user world with Movedo. Build an eCommerce store likely to succeed, or build one that absolutely rocks! It's up to you. If the latter appeals to you, give XStore a try. This responsive, minimalist WordPress theme gives you 70 ready-to-go shops to choose from. Having installed one (it takes about one minute), use XStore's premium plugins (that includes the Smart Product Reviewer 360°) to dress your store up. Be sure to browse XStore's inspirational showcase of customers' websites. There's no shortage of excellent choices here. We realize it might take you some time to narrow the candidates down to 2 or 3 products. But we believe you'll find it's time well spent. Should you run into a problem, it's because choosing among premium products is seldom an easy task. These are 15 of the very best multipurpose WP themes on the market.